The global market for smartphones is growing by leaps and bounds, and now there is a new ruler of that kingdom, and it’s name is Android. According to Gartner, smartphone sales for the third quarter of 2011 grew to over 115 million, representing a 42 percent jump over the same quarter last year, and leading that charge has been Google’s Android operating system. Nearly tripling its unit sales year over year, Android also more than doubled its share of the operating system market from 25.3 percent to now stand at 52.5 percent. Meanwhile, Nokia’s Symbian OS, the long time crown holder of the market, fell nearly 20 percent from 36.3 to 16.9. As Nokia is now switching over to the Windows Phone system, this number will do nothing but decrease, but it definitely looks like a lot of people opted to go the Android route when it came time for a new phone instead of staying with what they knew. 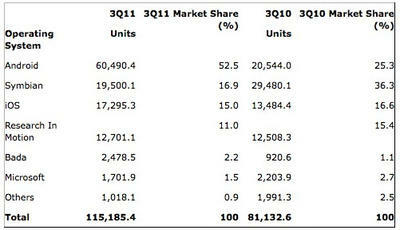 Despite an increase in the number of units sold, Apple’s iOS dipped from 16.6 percent of the market to 15 percent. Amongst all of these shifts between the power players, the numbers also show that Microsoft simply can’t catch a break in the mobile space. Not only did its total number of units sell dropped, but its meager market share of 2.7 percent dropped even lower to 1.5 percent. Perhaps its new partnership with Nokia will breath some life into the operating system, and if it could capture at least some of the remaining Symbian share it would do well for itself, but it certainly has a long road ahead of it. Obviously the policy of anyone being able to use Android is paying off for Google in a huge way when it comes to market share, but one has to wonder how the chart would look if you broke it down by versions. While it’s still all Android at the end of the day, the number of 2.1, 2.2 and 2.3 devices fragments the share to a degree, and definitely in the eyes of developers. Even with Ice Cream Sandwich on the way – which will end the phone and tablet fragmentation – there will still be a lot of phones floating around out there running older versions of the system and continuing the frustrations of those who build software for the OS. 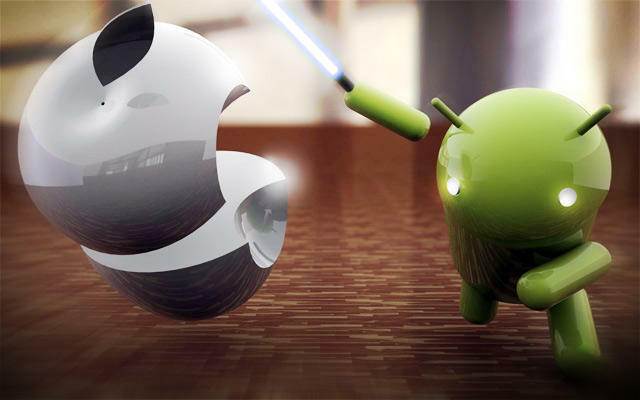 All that being said, Android is now the king, and it certainly looks like it will take a lot to topple it from its throne.